Another blend of Holmes and science fiction worlds! My thanks go out to Derrick Belanger for my copy of this book. I appreciate his continued faith in my reviews. Taken as a whole, this volume is fabulous! Each author has blended Well’s worlds into the world of Holmes like an expert bartender. 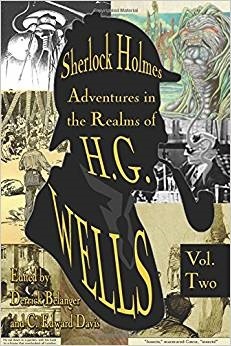 They are excellent Holmes stories while remaining also fitting for the Time Traveler, Dr. Moreau, the Invisible Man, etc. “The Clash of the Miracle Men” by Rohit Sawant is based on the Wells story “The Man Who Could Work Miracles.” There is a neat twist in this story. “The First Selenites on the Earth” Derek Nason reverses the plot of Wells’ “First Men in the Moon.” In this story, Professor Cavor brings Moon Men to the Earth. “The Adventure of the Disintegrated Man” by Michael T Wells has Holmes investigating ashes and an arm, which is all that is left of a man… I am not sure which story inspired this tale. “Sherlock Holmes and the New Accelerator” by Mark Levy concerns an impossible theft happens under Holmes’ nose. This is based on Wells’ “The New Accelerator” from the pages of the Strand Magazine. “A Trap to Catch the Sun” by Andrew Lane is a tale of grave robbery and unusual jewelry. Again, I am not certain of the source of inspiration. “The Misplaced Mystery Writer” by Richard Paolinelli is based on “The Time Machine.” Wells has built the machine himself and already tested it. He has taken Edgar Allan Poe with him and lost him in time. Kudos for the explanation of Poe’s death and the long-lost identity of Jack the Ripper! Best in Book! “Dr. Watson’s Fragments: The Shape of Deductions to Come” has no given author. A certain blue box lands inside 221B. I got the mental picture of Tom Baker as the Doctor while reading this! Derrick, you have a wonderful series going here. I would love to see more volumes! This book I give five stars!